People are always asking me about face shields. I have found that face shields are HIGHLY PERSONAL. What one person likes, others will hate! Therefore you should try before you buy. Try at a class, school, club or a friends house. I have several different models of face shields in my studio. I can never predict in advance what people will like. I started out with a simple “MSA Defender +” face shield from a local store. Around $15. I still like this face shield and use it when other people are around. I have several of these in my Studio and most people like them or can live with them. I primarily like this face shield because it is tough and there is lots of space between the inside of the clear plastic and my face. Thus it does not fog up easily and it does not fog up my glasses. Unfortunately this face shield is no longer available. It was discontinued. MSA does not make anything similar in a low price range. If I wanted something similar today I would try the “Heavy Duty Faceshield” #199210 from www.packwoodworks.com for $22 on 4/2019. I like that Packard says ” The shield allows room for people who wear glasses”. I hope this means the face shield will not come to close to my face. I also hope it is not to heavy. I DO NOT own one of these and have never seen one up close and personal. The Sellstrom S32010 on Amazon for $30 on 4/2019 also looks good. I DO NOT own one of these and have never seen one up close and personal. The Safety Works Faceshield for $17 on 4/2019 on Amazon may be similar to my MSA Defender + face shield. Is it ANSI rated? I DO NOT own one of these and have never seen one up close and personal. Several of my students have and really like the “UVEX by Honeywell S9500 Uvex Turboshield Face Shield Headgear with Black Frame” $22 with a “UVEX by Honeywell S9555 Uvex Turboshield Clear Polycarbonate Replacement Visor and Clear Lens with Dual Anti-Scratch/Anti-Fog Lens Coating” $28. You have to order the headgear and clear lens separately. They snap together. You can get a cheaper lens with out all of the anti… crap for $13. That is what I would go with. I don’t like anti… crap on my glasses, etc. However, my students say the cheaper lens is not as good. The cheaper lens is a “UVEX by Honeywell S9550 Uvex Turboshield Clear Polycarbonate Replacement Visor and Clear Lens, Uncoated”. All of the above prices are on 4/2019. This is not the face shield for me. I like my cheap and dirty ones. I have been wearing glasses for 50+ years. A little dirt is normal and does not bother me. If you like to keep things clean and insist on a really clean face shield then this UVEX face shield may be for you! Beware! I already told you face shields are HIGHLY PERSONAL. You may like, what I don’t like. I known people who have and like all of the following. I don’t like the yellow Apprentice Face Shield from Craft Supplies USA. To flimsy. To close to my face. I don’t like the blue 3M Face Shield from Craft Supplies USA, Amazon, etc. Way to close to my face. I have these in my studio. Only like 1 in 10 people like these. It’s built like a tank on the plus side. But, I still really don’t like it. I don’t like the Bubble Face Shield from Craft Supplies USA. Fogs up to easy due to closure at bottom of face shield. I need a face shield that has a big open space at the bottom to allow my hot breath out. I have these in my studio. Most people are not thrilled with these but can live with them. I don’t like any face shield with plastic below the clear part. i.e. near my chin. Chin guards, etc. Like, I already said. I need a face shield that has a big open space at the bottom to allow my hot breath out. Thus I don’t like any of the Uvex Bionic shields. All of the above are Non Powered face shields. There is no fan that forces air over your face while wearing the face shield. Thus you have to put up with any heat build up or fogging. Thus the face shields need to be open at the bottom and/or top to allow air circulation. They are good for beginners and/or light duty use. Face shields that are part of a helmet (hard hat) are generally to much trouble for beginners. But, after a few close calls, experienced turners often favor them. When things come off the lathe, all hell can break loose. Things (wood, etc) can bounce off the ceiling and come down on top of your head, etc. The helmet systems incorporate a small fan with a rechargeable battery. This often adds way to much to the cost for beginners. The fan forces a stream of air over your face. The air is normally filtered. I am NOT saying “fresh” air. It is just filter air. The “Trend Airshield Pro” for $380 on 4/2019 currently is the only game in town for less than $1000. I I DO NOT own one of these. I don’t known what to say about these. 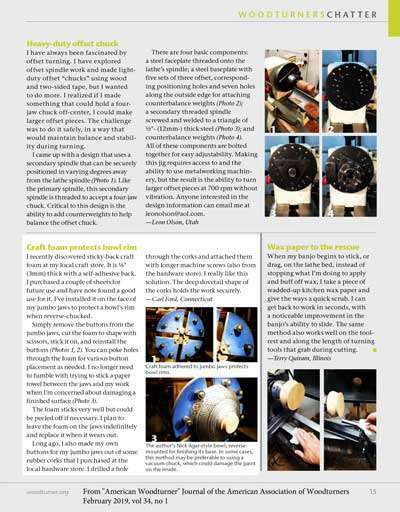 Recently, Mark Baker gave it a positive (but not glowing) review in the UK Woodturning magazine. This style of unit has the batteries and filter up on the helmet rather than down on a belt around your waist. The current model moved the battery and filters to the back (rather than up front) for better balance. I have (but have not used in a long time) a similar “3M Airlite” with the battery and filter on the helmet up front. I had a love hate relationship with this unit. I always forgot to charge the battery. Even when I had a spare battery. The fan did not blow enough air to satisfy me. I personally like lots (tons) of air! Your mileage may vary! This unit was long ago discounted. The new 3M models start at over $1000. Note: I don’t known if the new “Trend Airshield Pro” would move enough air for me. I have never really tried it. Eventually, I replaced the 3M Airlite with a “Triton Powered Respirator”. It was a hard hat style helmet with the battery and fan on a belt around your waste. This one supplied a little more air. But, still not enough. Donning it was a pain. This unit has also been discounted. Then I decided that all of these battery units were never going to supply enough fresh air to satisfy me. I replace the battery box and fan on the Triton unit with a 20′ long 1.5″ diameter light duty hose that was driven by a 6″ in line duck fan. The fans they use for boosting air flow in AC systems. This worked reasonably well. But, I got tried of that 1.5″ hose. It was hard to coil up and store. If I stepped on it, then I was screwed. I decided to bite the bullet, when I became a full time Woodturner. I got an Allegro fresh air system. See next section. When I work in the studio by myself I use my Allegro fresh air system. It brings in fresh air from outside via a small 3/8″ ID (5/8″ OD) BREATHING air hose. Being restricted by an air line is not for everyone! I like the fresh air! I wish the air line was a little more flexible. But, it is tough. If I step on it, it’s not the end of the world. This is the kind of system they use in auto body shops for painting, sand blasting and welding. I don’t like the Trend Airshield, etc systems. The fans are to wimpy for me. I like lots (tons) of COOL air! Anything that involves “breathing air” is not cheap. 50 feet of 3/8″ air hose for tools, etc, is like $15. You don’t want to breath thru some cheap plastic air hose that may still be out gasing toxic chemicals, etc. 50 feet of certified 3/8″ breathing are hose starts at $100+. The Allegro 9245 system in photo starts at around $1000. Its a low pressure system. I actually have over $2000 in my system. I have the bigger A-1500 pump rather than the A-300 pump in photo. I also have a low pressure air cooler that I modified to fit in a chest freezer so I don’t have to supply fresh ice daily. The air that comes out of my big pump is to hot for my liking. I like to have my face bathed with a cool breeze. I have, an external intake hose connected to the pump that bring in fresh air from outside. Plus 100′ of hose, fittings, etc. It all adds up. I am not interested in USED systems on Ebay, etc. I don’t want to breath thru the same system that someone else has already used. I don’t known if they kept it clean. I don’t know what they were using it for. Toxic chemicals? Fine sand blasting dust? Etc. If I had to do again I would get the A-750 pump. I got A-1500 pump because I like lots (tons) of air! I decided the A-300 pump would probably be to small for me. The A-1500 pump is to much! It runs hot because it supplies lots of air. I have to vent almost 1/2 of the air at the pump. It costs to much to run. The pump is hard to deal with because it is really heavy. Some day I may upgrade to the 3M M-107 Versaflo Helmet or the full hard helmet from Allegro rather than the half helmet that I have. An added bonus of this system is that it works great while sanding or spraying paint. When I finish my work the rattle spray cans, etc of nasty stuff, I don’t breath it and I can’t smell it! I strongly recommend you try something like a “Trend Airshield Pro” and decide you RALLY can’t live with it. Before you go with one of these EXPENSIVE systems! Note: Low pressure systems use a little pump like shown in above photo. High pressure systems bleed the air off of a big gas powered air compressor. The kind they use on construction sites to power jack hammers, etc. You can only use a venturi effect air cooler on high pressure systems. 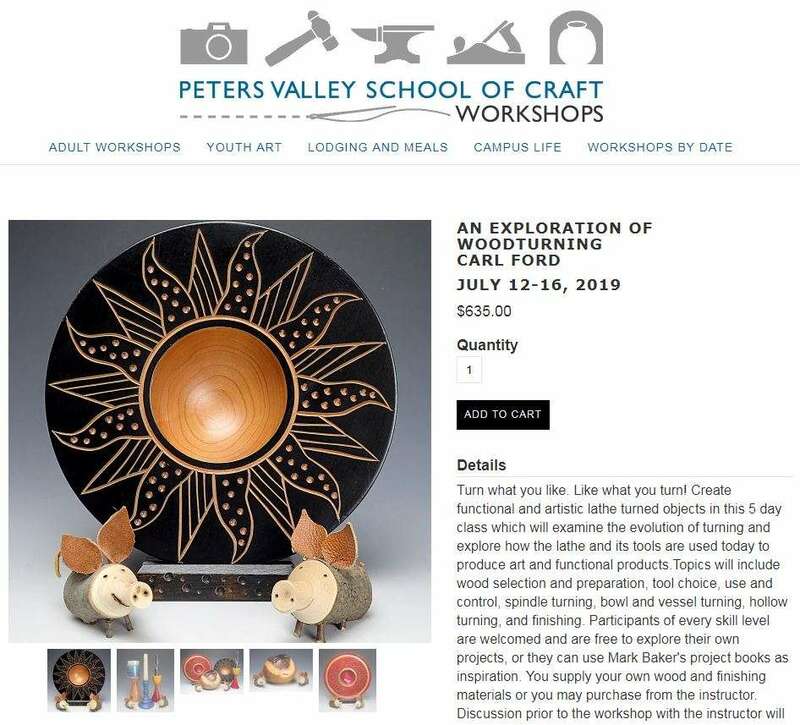 I am going to be teaching my 5 Day Woodturning Workshop class at the Peters Valley School of Craft in Layton NJ (in the Delware Water Gap National Recreation Area) on July 12-16, 2019. 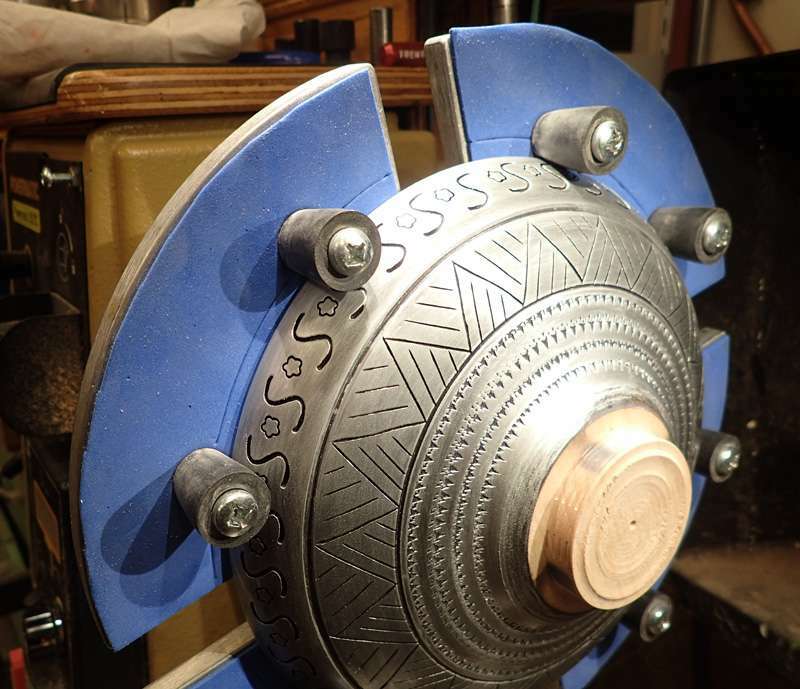 Their name for it is “An Exploration of Woodturning”. Click here for more info or to sign up on the Peters Valley web site. There is also more info in the Student Material List. Lots of info, not just a materials list. Click here for additional info. P.S. 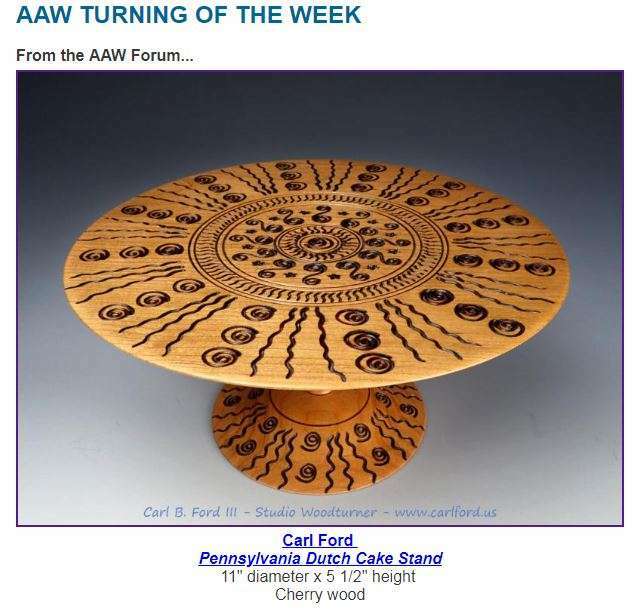 My Pennsylvania Dutch Cake Stand was just selected as the “AAW Turning of the Week” on 3/6/2019. There are no fixed projects in the above class. Students are free to do there own thing. Pick there own projects. Thus students can make a cake stand in the above class if they want. With or without the decoration. Or we can do similar decoration on a plate, bowl, etc. Click on the photo below for more photos of my recent work.